I am so glad I had the chance to read Outdoor Math and have only positive things to say about it. This delightfully illustrated book is super fun and packed with hands-on activities that focus on going outdoors and playing. 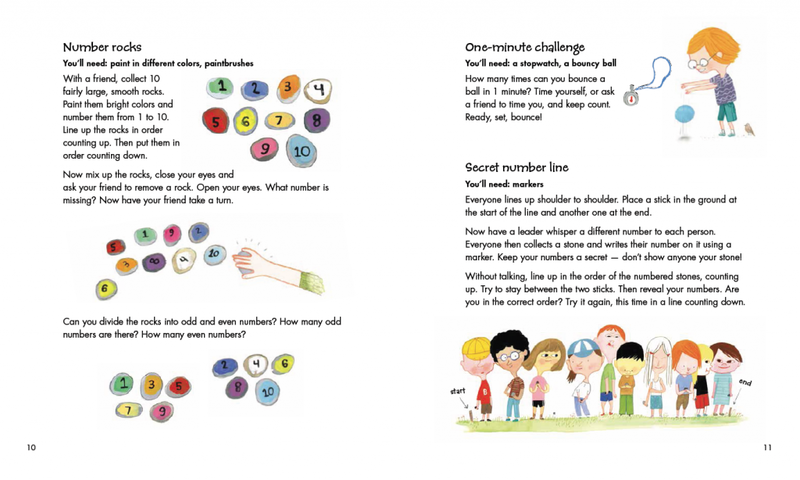 The book starts off with an introduction to numbers 0-10 with real world examples, then there are numerous math activities for each season of the year, followed by a brief explanation and examples of plus and minus, then multiply and divide. There’s even some science that can be learned especially when engaging in the seasonal-themed activities. 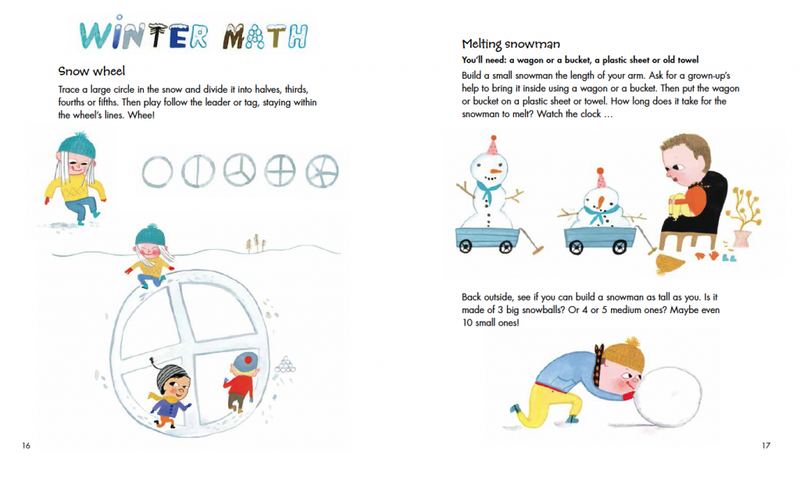 Outdoor Math: Fun Activities for Every Season, written and illustrated by Emma AdBåge, Kids Can Press ©2016. 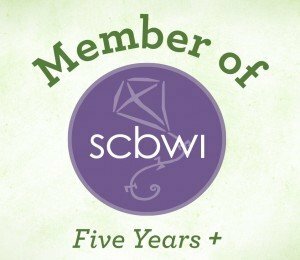 The majority of the book is divided into the four seasons, each with five to seven outdoor math activities so the book provides year round entertainment and education. All of the activities listed looked interesting so of course I had to try a few. My daughter and I enjoyed bouncing a ball for a minute. She was so good at bouncing the ball it was hard to keep track, but we managed to count 135 bounces in one minute. Then we played Tic-Tac-Toe from the book’s Autumn section. We had such a good time playing with our placeholders–seedpods and bits of mulch. After three tied games, I was the lucky winner! 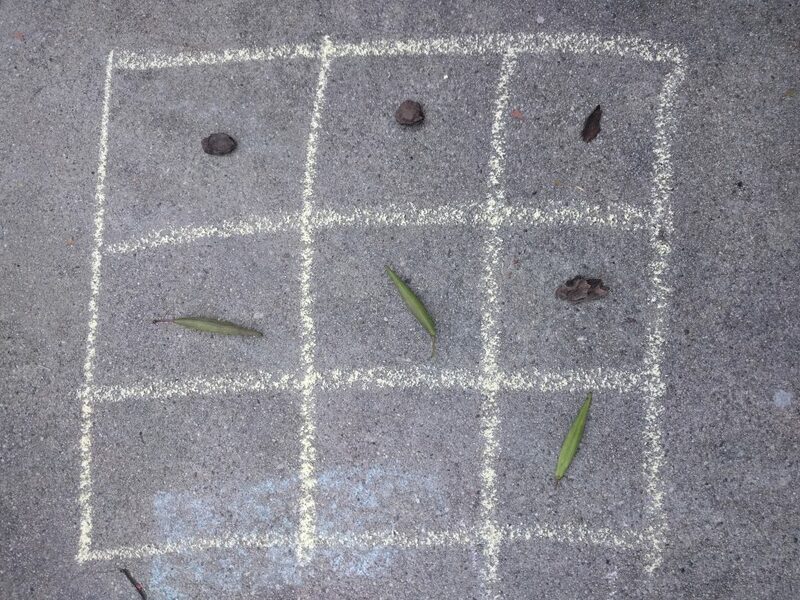 Photograph of Outdoor Math inspired activity – Tic Tac Toe by Lucy Ravitch ©2016. The counting and tossing outdoor activities are sure to be a hit with kids even as young as three years old. I felt the rest of the activities could work for almost any age. 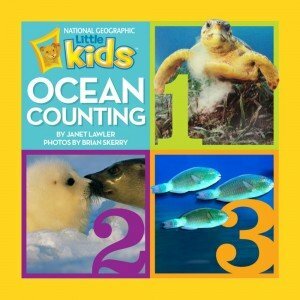 There are timed activities with counting, as well as activities with maps and shapes, and some games that require coordination. What I love about the book is how many of the activities have kids exercising while they’re doing a math skill. 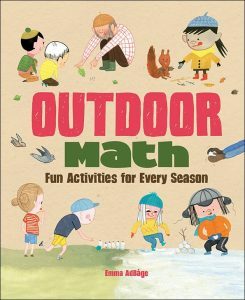 Outdoor Math: Fun Activities for Every Season gives great examples of educational play with simple rules for young kids. Although I live in sunny southern California where it’s summer almost all year long, the activities can be done anywhere. The book is a wonderful STEM resource because it’s easy to substitute objects depending on the time of year and where you live. For example, Pine Cone Math where you collect pine cones can be substituted with shells, rocks or toys instead. I feel confident recommending Outdoor Math as it’s a terrific book for kids and their parents/teachers/grandparents that’s certain to get everyone moving outside while doing math activities. It goes to show that math is all around us and almost any activity can be a math activity! Thank you Emma AdBåge for making a playful and hands-on book for kids. After playing Outdoor Math, your kids might just find other ways to incorporate math into play too. I was surprised and happy to see my kids making designs from the objects we used. In fact, as you can see below, there is even math to be found in neat designs! 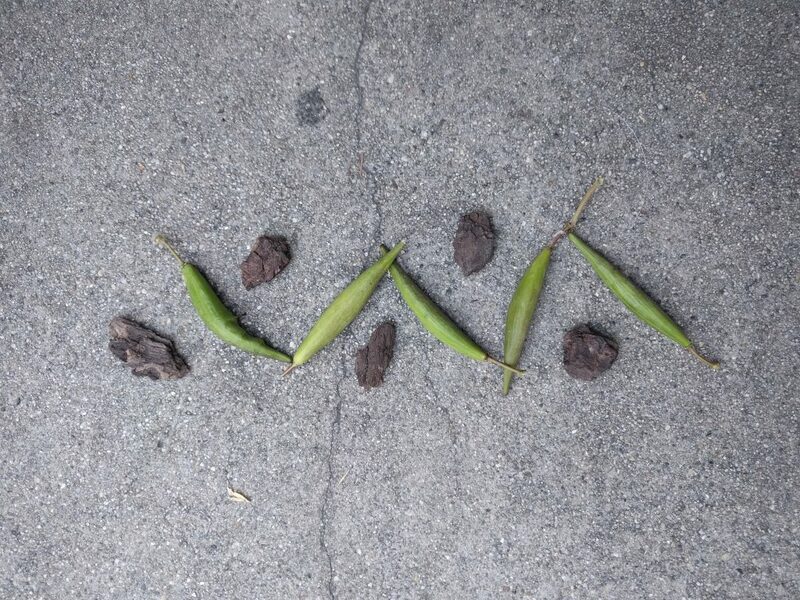 Photograph of Outdoor Math inspired activity – design from nature by Lucy Ravitch ©2016. Using race cars to demonstrate the concepts of addition and subtraction, Pete and Tom work together, building Tom’s math proficiency levels. When their teacher, Mr. G., suspects the two cool cats have copied from one another on a math test, they demonstrate how using race cars made learning fun. This hardcover book comes with 12 flash cards, a fold-out poster, and stickers. To do Pete’s “Meow Math,” twelve number stickers are included along with addition, subtraction, and equal signs. You can also count blocks or race cars, or play with the Pete and friends stickers. The flash cards feature numbers one through ten; the word is printed on one side and digit on the other. For example, the back of “Five” shows “5” and five surfboards. Two “Directions” cards explain that kids can either learn the sight words or use the cards to practice their math skills. Dean’s bright, deadpan-funny illustrations are once again a mainstay. 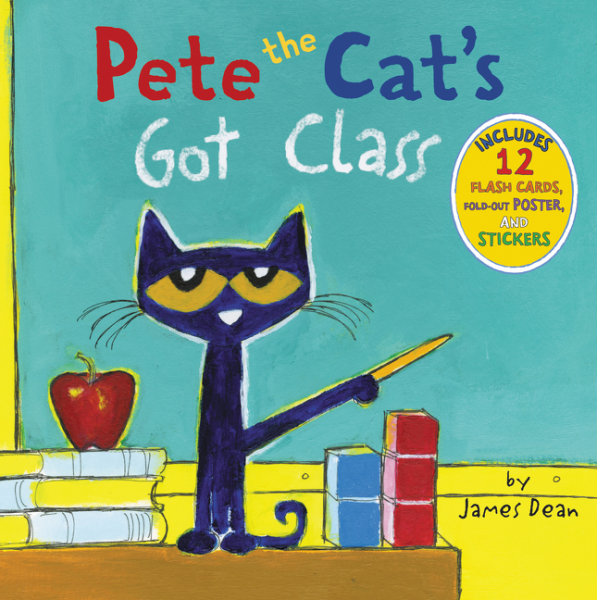 The story line is interwoven with basic addition and subtraction problems, presenting an element of education in Pete the Cat’s Got Class. Find out about author illustrator, James Dean here. 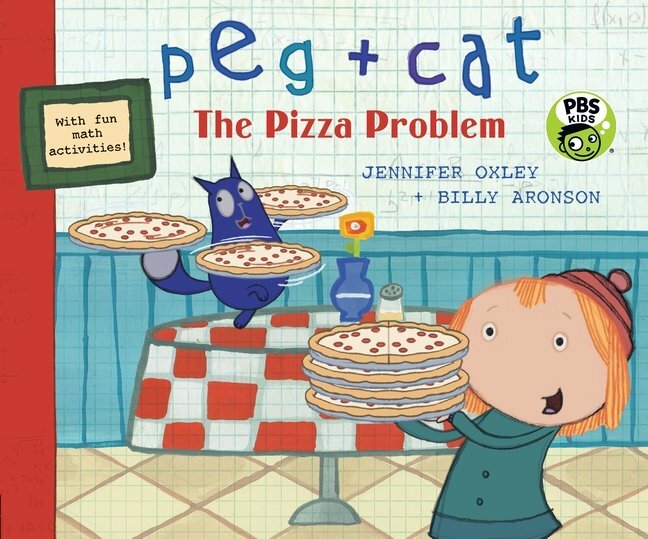 Peg + Cat: The Pizza Problem is another wonderful book from the creators of the popular educational PBS show, Peg + Cat! You don’t need to be familiar with Peg + Cat to enjoy this book because their characters shine through in the text and illustrations. Peg and her cat open up Peg’s Pizza Place and are excited to serve the first customers when she gets an order for half a pizza among the orders of whole pizzas. At first she doesn’t know what half a pizza is, but luckily her friends come and help her realize that half a pizza is just one pizza cut down the middle, a semi-circle. Peg and Cat continue to fulfill new orders and provide entertainment for the customers, but then there is a dilemma! Peg gets four more orders and there’s only enough ingredients to make two and a half pizzas. Luckily, some of the orders were for half pizza pies, so she just might have enough to satisfy everyone. Peg + Cat: The Pizza Problem is a terrific book for kids ages three through seven who will appreciate the bright and cheerful illustrations while learning helpful math concepts. The story really had some good twists and turns, so much that it kept me engaged because I wasn’t sure what was going to happen next. I’m always happy to see math concepts being introduced and taught in real-to-life scenarios so kids can grasp the concepts easily. I also enjoyed the part where Peg got so stressed and had to be reminded to count down from five to one to calm down–an important lesson kids and adults both need. Thank you Jennifer Oxley and Bill Aronson for your great work with Peg + Cat! 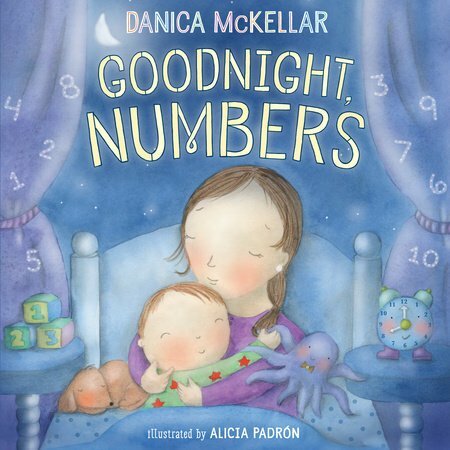 We look forward to what other fun math related books you create. Download an activity kit here. Read Lucy’s review of Peg + Cat: The Race Car Problem here. This book piqued my interest with its funny title, so I chose to make it my first read of the three math stories books I received. It has a relatively simple story of a frog whose hat has blown away and an elephant who sits on it. Stubborn and greedy Elephant will not move one inch, demanding different shaped food to eat. 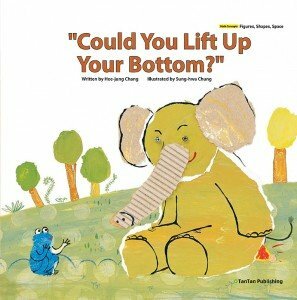 Frog fulfills the elephant’s requests in hopes that Elephant will lift up his bottom and get off of the hat. Love it! Eventually Frog is able to get Elephant to eat part of a honeycomb in a beehive. He then runs off due to the bees going after him. Could You Lift Up Your Bottom? reminded me a bit of Jon Klassen’s, I Want My Hat Back but teaching shapes along the way. 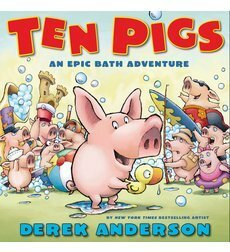 The illustrations are unique and should appeal to kids because they can duplicate the simplistic art style. 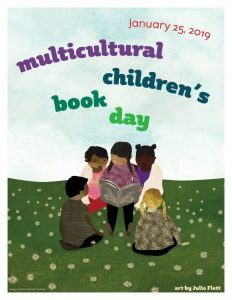 This book would be a good one to borrow from a library or have in a classroom. It has some nice information and suggested activities in the back of the book as well. This picture book is about a boy visiting an art museum with his family. 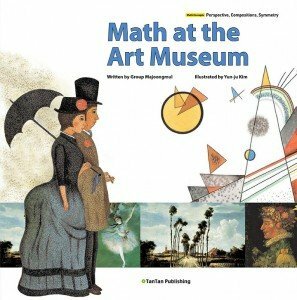 The museum is having a special “Discover Math in Art” exhibit. Numerals, colors, shapes, direction, perspective, symmetry, and time are discussed as the family looks at different paintings from Seurat, Picasso, Degas, and more. 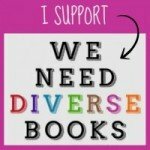 I found this to be an enjoyable read that would engage children 4-9. In addition to liking the story, kids would like looking at the artwork presented in the book. Again, the publisher gave information in the back matter with suggestions for activities, but my favorite part was this quote, “Because math is not a field that deals only with numbers and calculations, it’s important to encourage children to look for and learn from mathematical concepts in unexpected places, including in artwork.” I wholeheartedly agree–we should be showing children that math is all around us and isn’t just a stand alone subject to be shared only in school. I’m happy to discover these kid-oriented math stories that strive to make math concepts accessible to all. 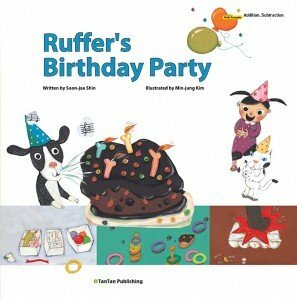 My final read from this group of books was Ruffer’s Birthday Party by Soon-jae Shin and illustrated by Min-jung Kim. 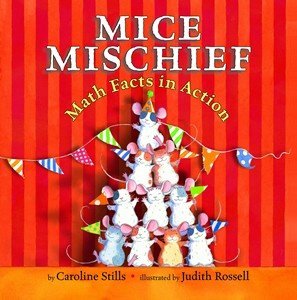 The concepts emphasized are addition and subtraction, but a lot of other math concepts were shown in this book! I know kids will love it with the hands-on math examples. Ruffer is Nora’s pet dog and it’s his birthday in four days. They make invitations (to three friends and their pets–which they have to add up since they want to give an invitation to each of them), count down to the birthday party, bake a special cake (and since they are short on eggs they have to buy more at the store), they go to the store for last minute items (and there is a sale so we have to figure out the full price minus the discount and eventually figure out the total of the sale). Then, at the party Ruffer gets presents (and makes a chart to organize them–bones, stuffed animals, and balls) and everyone plays a ring toss game (in two teams with a few simple rules). It’s a fun read for kids who already love birthday books too!